Edit October 13 - For the final day of the Cyber Monday Sale, Hudson's Bay is offering $20 off when you spend $150 or more with the promo code FINAL (offer ends at 11:59pm ET tonight). October 7 - Happy Thanksgiving Weekend Canada! 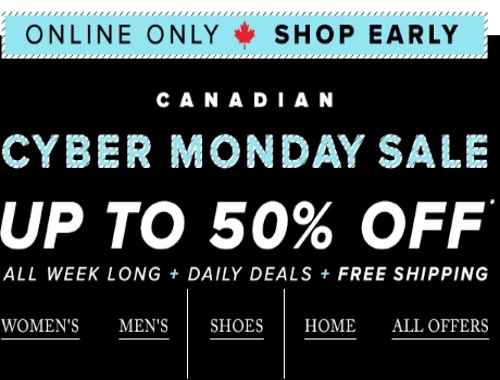 Hudson's Bay has a Canadian Cyber Monday Sale on now that you can shop early online! Check back each day for today's Cyber Deal, click here for that post. All week long there will be daily deal and Free Shipping on almost all orders! Plus get an extra 15% off if you're a Cardmember! Enter the promo code CYBER at checkout to save an extra 15% off with your Hudson's Bay Mastercard or Hudson's Bay Credit Card. Offer is valid Friday, October 7-Monday, October 10, 2016. Click here for today's Cyber Deal.